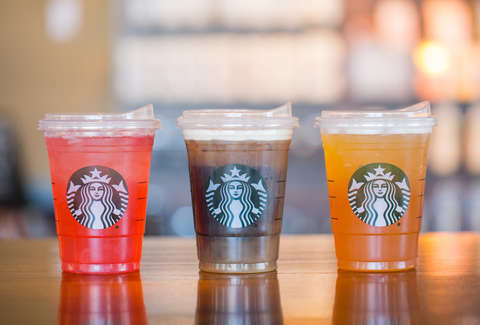 Unless you've been living under a rock -- or a floating island of plastic refuse, which is almost as common as rocks nowadays, unfortunately -- Starbucks has recently committed to going (nearly) straw-free by 2020. Though it will still have straws available upon request, which is especially pertinent to those with disabilities that actually need to use straws. But for the most part, all their cold drinks -- which now account for about half of their overall drinks sold -- will be topped with plastic "sippy cups" (their Frappuccinos will continue to use straws as they are essentially glorified milkshakes anyway). But still! This move will apparently eliminate one billion plastic straws per year. Which -- obviously -- won't single-handedly solve the alarming issue of plastic waste clogging up our landfills, as they take about 400 years to biodegrade. Yes, that straw you slurp your morning cold brew will outlast your great, great, great grandchild, should you be that lucky. This should all come as great news if you are a reasonable human person. But, because people can be genuinely awful sometimes (most of the time), there was some blowback on Twitter about #Strawgate. Apparently, some people are frightened and confused to enter into a world without straws, Mother Nature be damned. Which, quite frankly, is kind of selfish. Not only will a Starbucks-sans-straws be better for the environment and potentially allow the human race to live till our sun explodes (it's coming, people), I would argue it's actually a better experience, overall.Right now, you can try their "sippy lids" (which, by the way, are made of biodegradable polypropylene content) on their Draft Nitro and Cold Foam drinks. So, I got a sneak peak at what to come. And I like what's to come, so so so much better than what has come before. These lids are a more enjoyable experience, overall. I took one of the new "sippy lids," and placed it on a standard iced coffee, just to be sure. And the overall experience of using the lid was actually preferable to sucking iced coffee through a straw. I felt like I could actually taste more of the coffee than I could via straw. The sipping method seemed to let that sweet, sweet, java flavor cover a wider swath of taste buds than the mini-garden hose effect of straws. It poured over my tongue. It caressed my tongue with it's velvety coolness. Basically, it tasted better. And there might be something to that theory, as sippy cups may be worse for your teeth than straws. I found the entire experience of actually bringing the cup up to mouth and sipping far superior than the straw method -- in tactile sensation, and in taste. I know all this seems really dorky and trivial, but I'm standing by my theory here. And I implore you to try it yourself before you judge. 3. Straws never really made sense in the first place? ...and all this led me to wonder why straws where even implemented in the first place? Hot coffee is naturally consumed via the same "sippy cup" style lid -- and while it obviously doesn't make sense to drink hot liquid via a straw, it does make sense that iced coffee is at least equally enjoyable via the hole-in-the-lid method. But again, is undeniable that straws make it possible for disabled individuals to enjoy these beverages -- which is certainly important, and a viable point, and Starbucks has made it quite clear that straws will still be available on demand for anyone that needs it. This may speak more to my individual depravity than anything else, but it takes me approximately 45 seconds to down any size of iced coffee with a straw. But this seems to be the case for most people. I know personally, using the sippy cup, I was able to make my coffee last longer. Unless you are going for speed in lieu of comfort, you will probably find the sippy lid to result in a longer lasting coffee drinking experience. Which is what you want when you spend $6 on a cup of ice and coffee. According to the Mayo Clinic, ingesting liquids at a higher clip (like iced coffee through a straw) can increase flatulence problems. This may be a slight stretch. But hey, if you want to risk turning your mid-afternoon data analysis meeting into dinner with the Klumps (yes, that was a Nutty Professor reference) be my guest. Hey -- this is coming via Renée Rouleau, esthetician to the stars, not me. Don't you hate it when you stick your straw inside a (properly) filled container of iced coffee, only to cause excess coffee to spill through the opening, creating a hazardous pool of brown liquid to form atop your lid, spilling all over your brand new white button down, causing your impending job interview to go poorly, thus costing you your dream career, and dooming you to a lifetime living in your parents basement, massaging your Mother's feet for a spare quarter every afternoon while Days of Our Life plays in the background? Yea, me too. I've poked myself in the eye at least twice while driving and drinking iced coffee. TWICE. Never again. Thank you Starbucks -- from myself, my left cornea, and our (now slightly cleaner) ocean.